What a storm on the mountain Thursday 03/30 night and into Friday 03/31! It was beautiful. A real April Fools blizzard with about a foot of snow dropped on the mountain. I spent couple hours snow blowing and shoveling Saturday morning, and pretty much ached all over that night. After comining in, a hot shower, and some advil I was all set, though stiff for sure. 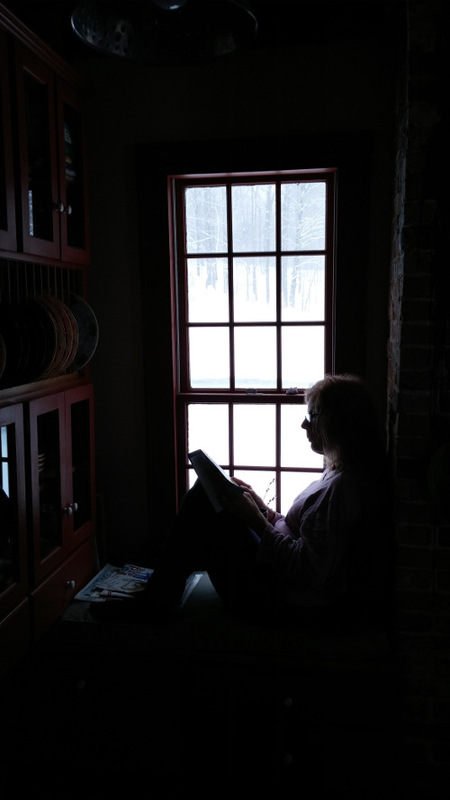 Sue starting the morning with a coffee and some quite time in her little reading nook looking out at the storm. Storm was a Nor'easter, and just blasted against the north side of the house and porch. It was a heavy, wet snow that bowed the branches of the trees in the woods out back. Sue can't wait to get out into this chair and do her morning reading. It'll be awhile before this all melts off! Gotta clear the walkway just to get out to the barn to fire up the snow blower! Getting through the huge drifts in front of the driveway thrown up by the town plow was the hardest part. I really need to get chains on the tires for next year.... Whew! The snow blower really struggled with the weight of the snow. 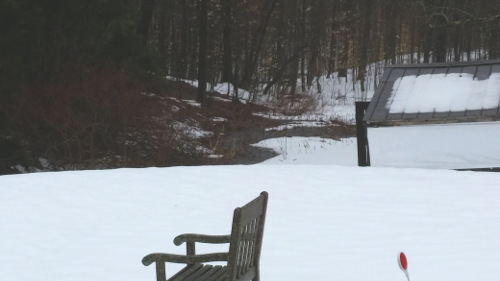 Later in the week, the temperatures were in the 40s with good sun for a couple of days, and then heavy rain. The culvert by the barn got overpowered with all of the water, and flooded a huge section of the back yard. Amazing! We now have waterfront property! 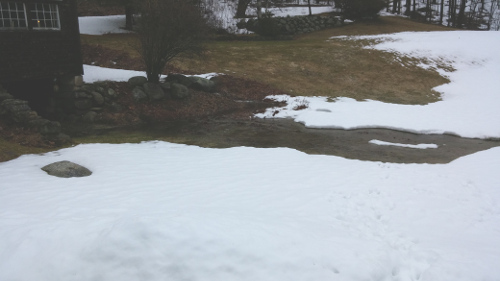 Fortunately, the land dips and slopes down away from the house, but the creek was really flowing!